We’re very approachable and would love to speak to you. Feel free to call us or simply complete the enquiry form hereunder- we’ll call you soon. I would express my heartfelt thanks and gratitude to Kansas Immigration Services , for getting me and family CANADA PR. We reached Canada on September 4th , 2016.We are now in Ontario ,Canada got a job ,and living a peaceful life with God’s grace. 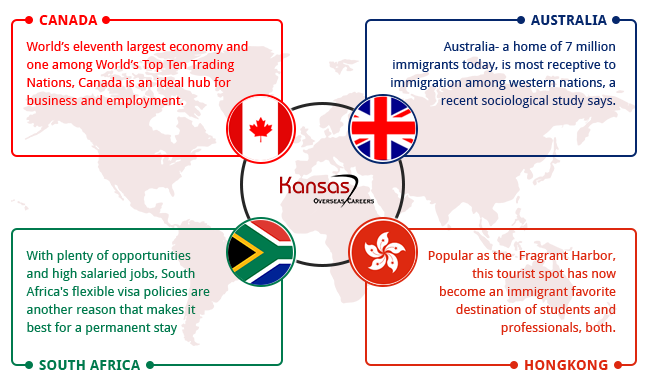 I'm deeply satisfied with the services I received from Kansas Overseas Careers. You have provided me all the vital information on Canadian Immigration Process. I really appreciate your guidance & followup during all the phases of my Visa process. I recommended Kansas to my friends and relatives, and wouldn't hesitate to recommend it to anyone who is seeking immigration help. Delivering great customer outcomes, Kansas Overseas Careers today, is the backbone of many successful immigrants from India! The first step to an overseas career is adequate and accurate career counselling. Authenticity and accuracy are the key elements our evaluation service. We have a team of process consultants who are proficient in all types of visa documentation.